I actually made these labels a while ago, but never wrote about or shared pictures of them all, other than on social media. 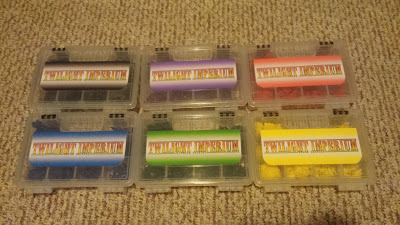 This is the most extensive label project I've done so far, there's one large box for all the cardboard pieces and then 6 small boxes each color coded to the colors of the plastic tokens. The large box's label was made by scanning the rule book cover and cropping it to fit. Then I used the logo from the same scan for the logo that is overlaid on it. I tried to get the image to fit as best as I could, I think it turned out well. The small boxes were made using the same logo as the large box. Then the background was colored with the color of its intended plastic tokens and then I put a strip of white in the middle. This was done to both save ink and to make the logo pop a bit more. 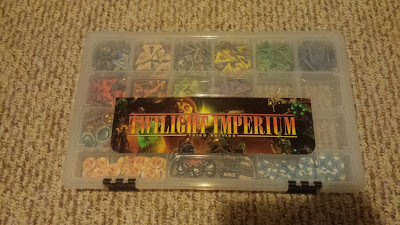 The best part about this whole set up, I can fit all of these cases into the actual game box, without removing the insert (I hate removing the insert). The only thing left to do is figure out a solution for the cards, but for now they can stay in the tray they come in. That's another token mess all organized! If you're interested in how I made the labels themselves, I have a tutorial for that. Its relatively simple, but requires a bit of graphics know-how.